blarchive (n): An admittedly forced play on 'blong' and archive. 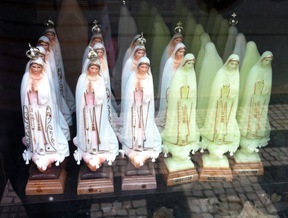 A rather innocuous toy from Wan Chai. 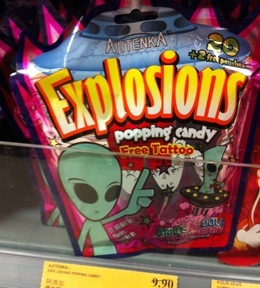 The toys themselves are rather boring, typical Hell O’Kitty knockoffs. At least they’re available in more than just ‘Cat’, as you can choose from ‘Sheep, Bear and Rabit’. One hopes rabit is not a combo of rabid and rabbit. ‘Babies love to be dandled(?) with Peek-A-Boo. Not only babies, even you will be delighted with the actions. A slight departure from our normal offerings. 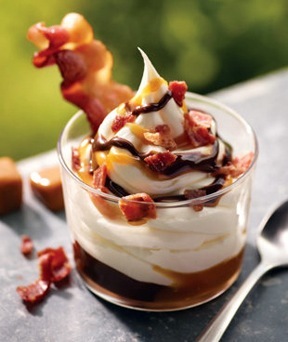 It seems Burger King (or BK Lounge as we used to call it back in the day) has gone all in (no I will not say ‘whole hog’ so don’t ask) with their new Bacon Sundae. And at only 510 calories, it actually clocks in lower than a sizable chunk of their usual menu! I have to say I’ve never had a hankering for a bacon/ice cream combo, but the Americans I polled guiltily admitted that they’d give it a shot. 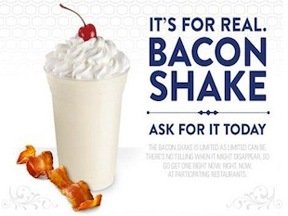 Upon further investigation, I discovered that Jack in the Box already has a 1,081 calorie Bacon Shake, which they proudly released months earlier.